Check out the Captain Marvel character pictures, posters, and stills from the film. 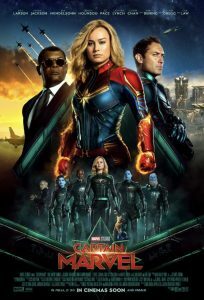 Captain Marvel is released on 8 March 2019, and stars Brie Larson as Carol Danvers, Samuel L Jackson as Nick Fury and Jude Law as the Starforce commander (probably Yonn-Rog – its been reported this week that Keanu Reeves was offered the role but had to turn it down down to scheduling conflicts with John Wick 3: Parabellum ). The movie is directed by Anna Boden and Ryan Fleck. You can watch the trailers and teasers, including the Super Bowl teaser, here.